Flight Centre's Gift Cards make unforgettable trips and cherished memories an easy thing to give. Give them a Flight Centre Gift Card and help loved ones build their travel dreams, whether those dreams include flying across land and sea, staying in hotels around the world, cruising or touring their way through new and exciting destinations, and more! E-Certifcates are virtual gifts that can be purchased and sent by e-mail. Think gift cards are lazy and impersonal? Well, when it comes to travel, gift cards are actually the perfect way to go! Booking a trip for someone can be tricky; do you know the exact spelling of their name on their passport? Do you know exactly when they are able to travel? Or exactly where they want to go? Changing a trip once booked can be costly, and sometimes not even allowed. Open up the world for those who want to see it on their terms. A Flight Centre Gift Card lets them choose where they want to go, when, and with whom. Holidays, weddings, birthdays and incentives are all great opportunities to give them what they really want. 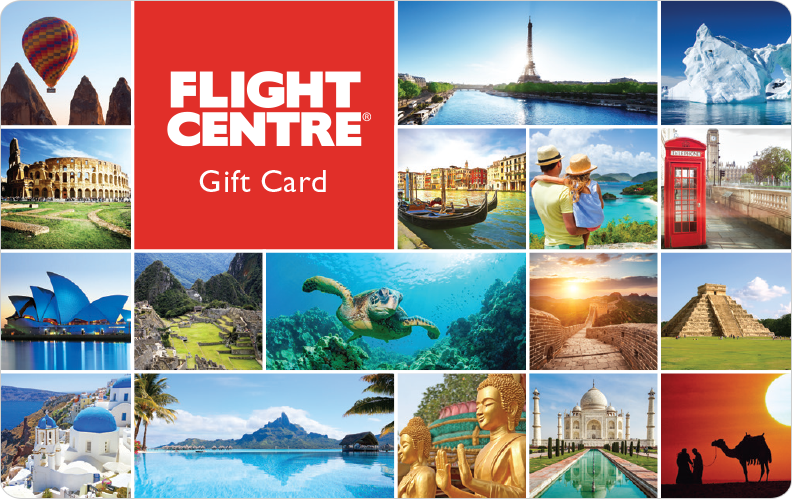 Get your Flight Centre Gift Card today and give the gift of travel. Once they have the Gift Card, they can simply book by calling us at 1 877 967 5302 or visiting any of our over 950 Airfare Experts in our over 110 Flight Centre stores across Canada. Need a last minute present? Get them on their way with a contribution to their journey. Purchase an e-Gift card online for e-mail delivery within 1 business day. Pick up the perfect gift for anyone who travels at any Flight Centre store to the value of your choice. Gift Cards can be used over the phone or in-store during regular business hours. Want to reward your hardworking employees or thank your clients? Ask about Flight Centre's corporate gift card deals. Are you tying the knot? When you create a Flight Centre Gift Registry, your loved ones can send you into married life with an unforgettable start on a beautiful honeymoon.